Japan invades the Ryukyu Kingdom. The Ryukyu Islands (Nansei Shoto) stretch across the East China Sea from SW Kyushu to 75 miles from Formosa (now Taiwan). Okinawa is the largest island in the chain. In 1879, the Meiji government annexes the Ryukyus, as Okinawa Prefecture. Nine Type C midget submarines, including HA-60 thru HA-68, are towed by small sailing vessels from Kurahashi Jima, Japan (Base "P") to Naha, Okinawa. Lt Tsuruta Tsuto is CO of the 1st "Dragon” Squadron. Okinawa. The 3210th Construction Battalion from Sasebo starts construction of a midget submarine base at Unten Bay's harbor on the island's northern coast. 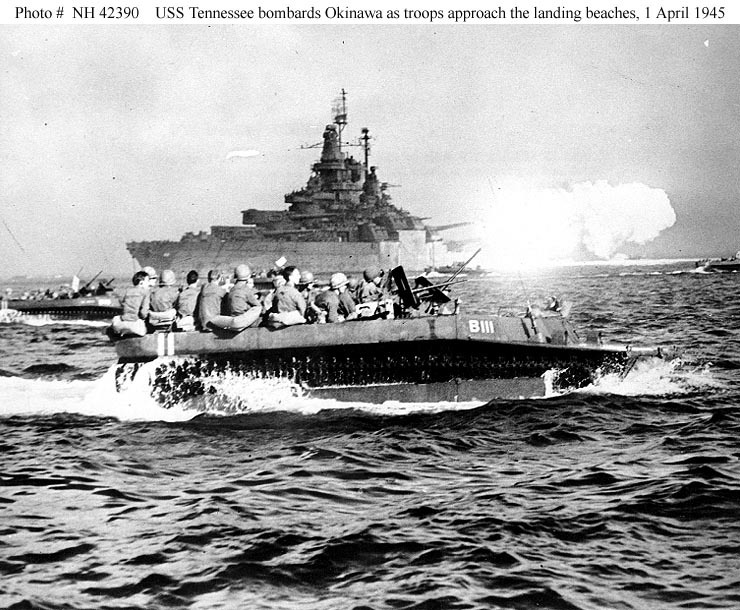 The base is shared by “Shinyo”(Ocean Shaker) explosive motor torpedo boats of the 27th Squadron. Vice Admiral (later Admiral) Marc A. Mitscher's (USNA '10) (former CO of HORNET, CV-8) Task Force 38 launches the first strikes on Okinawa for the pre-invasion landings on Leyte, Philippines. TF 38's aircraft strike the Okinawa area and the Unten base that is about 80 percent complete. A Grumman F-6F "Hellcat" fighter-bomber from BUNKER HILL (CV-17) drops a bomb between two midget submarines moored side-by-side. Midget submarines HA-61, HA-62, HA-63, HA-65, HA-66 and HA-68 are lost in the air attacks. Sasebo. 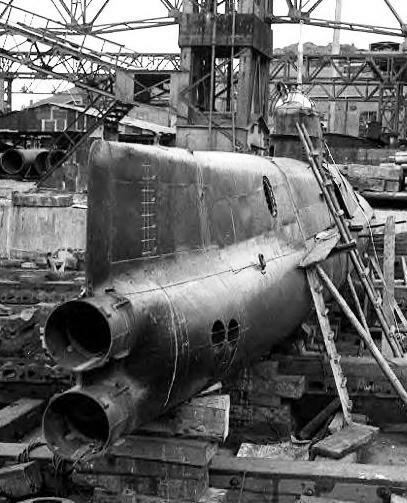 The damaged midget submarines are repaired. Transport T. 17 departs Kurahashi Jima, carrying Type D midget submarines HA-209 and HA-210. T. 17 arrives at Unten and unloads her cargo. The midget submarines are assigned to Lt Kawashima Gen's 2nd “Dragon” Squadron. After completion of repairs, the midget submarines and the two steamers depart Sasebo and arrive at Unten. HA-208 is the last to arrive. Later, FUJI MARU departs Unten for Kurahashi Jima to pick up the unit's remaining personnel. At 1538, USN codebreakers at Fleet Radio Unit, Melbourne (FRUMEL), Australia intercept and decode a message from Tokyo Naval Section that reads "1. The 4 type-“TEI" (Type D) midget submarines and the two type-“HEI" Type C midget submarines for assignment to Okinawa will leave Kure on Transport No. ? before the end of March. A total strength of 18 vessels is planned and a tender will be assigned later. 2. An additional 6 type-“TEI" midget submarines will be dispatched to Okinawa before the 20th April." Convoy KANA-101 consisting of cargo ships KACHOSAN MARU and YAMATO MARU No. 19 depart Kagoshima escorted by kaibokan CD-29, subchaser CH-58 and auxiliary minesweeper TAIAN MARU. The cargo ships are probably each towing a midget submarine. At 2200, arrives at Kuji Wan (Bay), Amami Oshima. At 0530, departs Kuji Wan. At 1030, the CO of CD-29 orders the convoy away from its intended destination of Okinawa and directs it to head to the China coast. Kurahashi Jima. FUJI MARU departs on her second voyage to Unten. Off Torishima. At 1350 (JST), FUJI MARU is sunk enroute to Unten by LtCdr (later Captain/MOH) George L. Street's (USNA '37) USS TIRANTE (SS-420) at 31-09N, 130-31E. Forty-five of the base's technical personnel perish in the attack. Off Keise Shima. Early in the morning, a recce plane reports sighting six American battleships, six cruisers and 20 destroyers. The CO of the Okinawa Area Auxiliary Base Unit, Rear Admiral (Vice Admiral, posthumously) Ota Minoru orders the Unten midget submarine unit to intercept and attack the enemy force. Kerama Retto. That same day, Rear Admiral (Vice Admiral-Ret) Morton L. Deyo’s (USNA '11) Task Force 54’s battleships, cruisers and destroyers bombard Kerama and the SE coast of Okinawa. At 1432, USN codebreakers at Fleet Radio Unit, Melbourne (FRUMEL), Australia intercept and decode a message from the Sasebo Naval District that reads “1. Midget submarines No. 201, No. 202 and No. 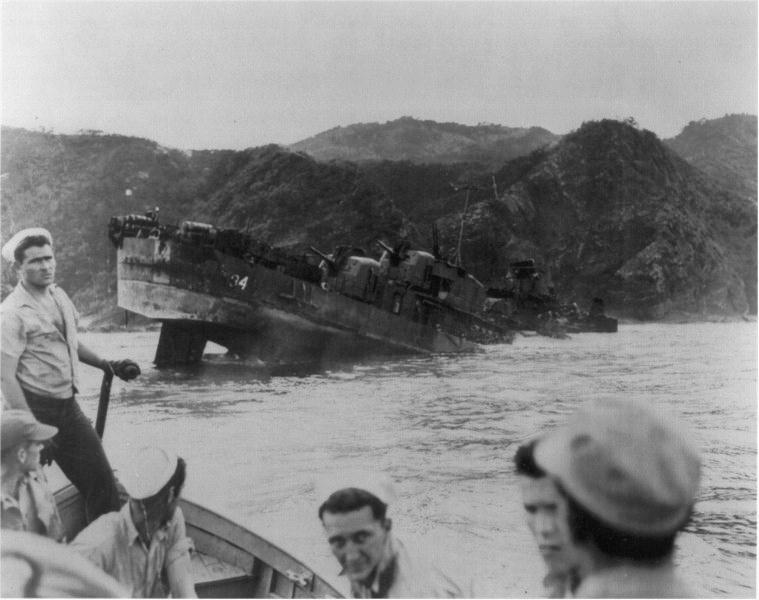 203 and the torpedo boats moving up to Okinawa will proceed to (Amami) O-Shima and come under the temporary command of (Amami) O-Shima Defense Unit. 2. 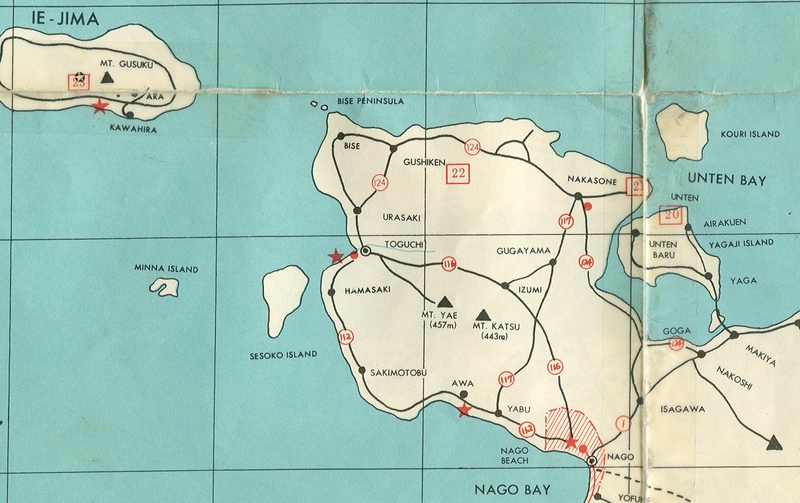 All convoys in the Oklnawa Area will make immediately for the nearest harbor in Kyushu." Yokohama. Also that day, Headquarters, Combined Fleet housed at Keio University, issues an alert for Operation "Ten-Go". That night, between 2200 and 2400, the 1st squadron, comprising Ensign Kawamoto Shichiro's Type C midget submarine HA-67, Lt Okawa Nobuyoshi's Type D HA-209 and Lt ( j.g.) Karashi Sadanao's Type D HA-210, departs Unten in one-hour intervals. Kerama Retto. The American 77th Infantry Infantry Division lands to capture advance bases and anchorages for the invasion of the main island of Okinawa. From 0940-1040, cruisers USS WICHITA (CA-45), ST LOUIS (CA-49) and BILOXI (CL-80) sight and avoid torpedo tracks that may have come from midget submarines. Okawa's HA-209 and Karashi's HA-210 go MIA. That evening, between 1756 and 2400, the CO of the 2nd Squadron, Lt Kawashima Gen's Type C midget submarine HA-60, WO Sato Takaaki's HA-64 and Type D midget submarine HA-208 depart Unten to participate in operation “Ten-Go”. HA-208 is forced to return to base soon thereafter because of a machinery breakdown. Yokohama. Headquarters, Combined Fleet activates Operation Ten-Go that calls for all air and sea units to engage in a "final decisive battle". Early in the morning, while recharging her batteries, Lt (j.g.) 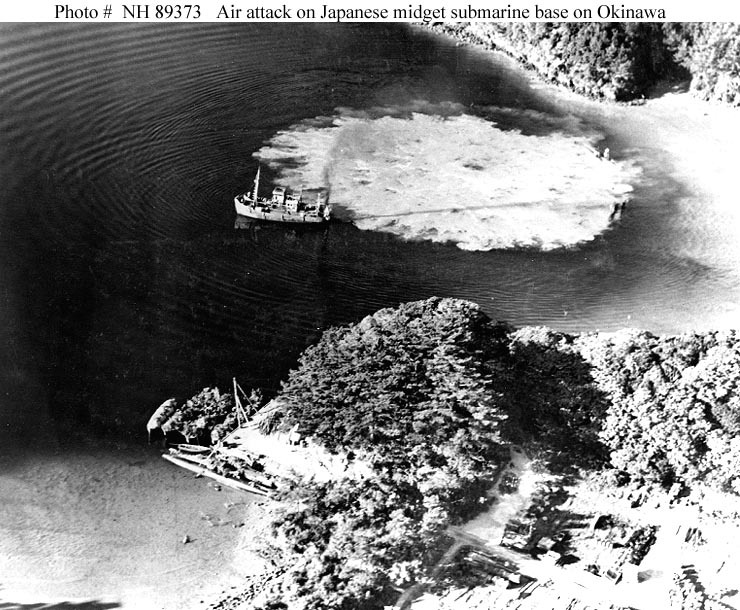 Sakai Kazuo's HA-208 is sunk in an air attack. Lt Kawashima's midget submarine HA-60 attacks Task Group 54. 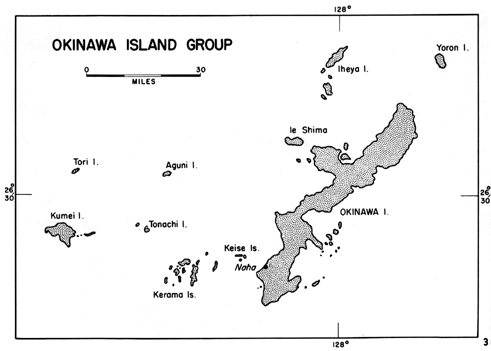 3 west of Cape Zampa Misaki (Bolo Point). At 0932, lookouts aboard USS WICHITA (CA-45) spot a periscope to starboard. WICHITA makes an emergency turn to starboard and evades a torpedo. USS ST. LOUIS (CA-49) also reports sighting torpedo tracks. Neither cruiser is damaged. Kawashima's HA-60 evades and escapes counter-attack. Around 1400, WO Sato's midget submarine HA-64 attempts to attack minelayer USS SUCCESS (AM-310) 6 nms W of Zampa Misaki, but misses with both torpedoes. Nevertheless, WO Sato is credited with seriously damaging a cruiser. Lt Kawashima's HA-60 and WO Sato's HA-64 return to Unten. On that day, the CO of Sasebo Naval Station sends a signal to the Unten unit with congratulations on its successful attacks. Unten. By this date, as a result of bombing, the number of serviceable midget submarines has been reduced to three. After sundown, Ensign Kawamoto's midget submarine HA-67 sorties from Unten, but has to return because of a machinery breakdown soon thereafter. Unten. Lt Kawashima's midget submarine HA-60 sorties from Unten, despite having a damaged periscope. His craft is attacked by a patrol aircraft and runs aground when taking evasive action. A serious leak appears and the midget has to be abandoned. In the evening, kaibokan CD-186 and subchasers CH-17, CH-49 depart Sasebo escorting landing ship transports T. 17, T. 145 and T. 146 to Amami-O-Shima. The transports are carrying various supplies and T. 17 is carrying two unidentified Koryu (Type D) midget submarines. Enroute, the convoy is attacked by aircraft and T. 145 is lost. Early in the morning the landing ship transport convoy arrives at Amami-O-Shima. Just after T. 17 disembarks her midgets, an air attack commences. T. 17 is hit by two bombs and sinks. CD-186 is also sunk. WO Sato's midget submarine HA-64 and Ensign Kawamoto's HA-67 sortie to intercept an enemy convoy sighted off Kadena Bight. Sato's HA-64 and Kawamoto's HA-67 return to Unten after an unsuccessful attack on an enemy destroyer at an unrecorded location. That evening, American ground forces advance on Unten. Vice Admiral (Admiral, posthumously) Ito Seiichi (former CO of HARUNA) CINC, Second Fleet leads the Surface Special Attack Force’s battleship YAMATO, DesRon 2's light cruiser YAHAGI, DesDiv 17's ISOKAZE, HAMAKAZE and YUKIKAZE, DesDiv 21's KASUMI, HATSUSHIMO and ASASHIMO and DesDiv 41's FUYUZUKI and SUZUTSUKI to attack the American invasion forces at Okinawa. Enroute, Ito’s small fleet is smothered in attacks by hundreds of American aircraft from Task Group 58. YAMATO, YAHAGI and four of the eight destroyers are sunk. That day, Unten's shore installations and the last remaining midget submarines, WO Sato's HA-64 and Ensign Kawamoto's HA-67 are blown up. Later, their crews join IJN land forces. 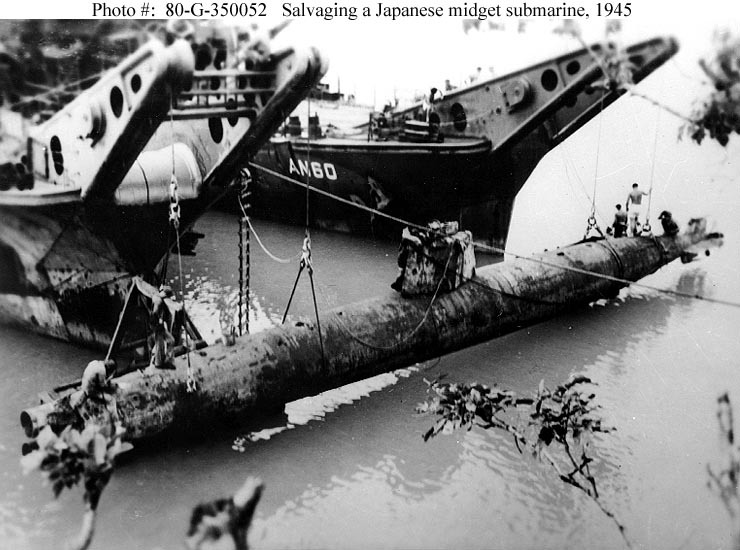 After suffering heavy losses during the fights with American troops, Lt Tsuruta orders the Okinawa midget submarine unit to be officially disbanded. After escaping from Okinawa island in a small boat, WO Sato (former CO of HA-64) and Chief Machinist Mate Yamada arrive at Yoron-Jima Island, Amami Islands, 12 miles N of Okinawa. An unidentified American submarine rescues eight Japanese from a drifting boat, all former members of the Okinawa Midget Unit. On 19 Sep ’44, JINGEI was torpedoed by USS SCABBARDFISH (SS-397) 80 miles NW of Okinawa. Damaged severely forward of the bridge by the torpedoes, JINGEI was later towed to shallow ground NE of Naha where she presented a stationary target for HANCOCK’s planes. The IJN's redundant hull numbering can cause confusion. HA-200 series Type D Koryu midget submarines should not be confused with identically numbered HA-200 series Sen Taka Sho small fast submarines. Lt Watanabe's name does not appear on unit casualty lists' therefore, it appears he survived. American sources claim gunfire support ship HALLIGAN (DD-584) struck a mine, but the Japanese claim the destroyer was torpedoed by Ensign Kawamoto's HA-67. Although, Kawamoto's claim of damaging a "battleship" with torpedoes cannot be confirmed, the ship may have been, in fact, HALLIGAN. Nothing is known about what became of the midget submarine raised by CATCLAW and BARETTA. Probably it was scrapped post-war. If a reader can provide further information, please post it on the Discussions and Questions board.